Results for the survey are based on face-to-face interviews conducted March 28 to April 19, 2008. Data cited are from the Horizon Consultancy Group. 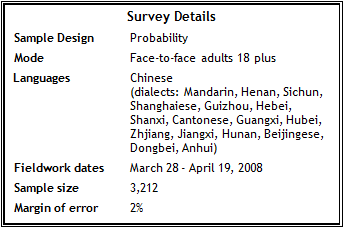 The table below provides details about the survey’s methodology, including the margin of sampling error based on all interviews conducted in China. For the results based on the full sample, one can say with 95% confidence that the error attributable to sampling and other random effects is plus or minus the margin of error. In addition to sampling error, one should bear in mind that question wording and practical difficulties in conducting surveys can introduce error or bias into the findings of opinion polls. The sample, which is disproportionately representative of China’s urban areas, includes eight major cities, as well as medium-sized towns and rural areas in eight Chinese provinces. The area covered by the sample represents approximately 42% of the country’s adult population. The cities sampled were Beijing, Changsha, Chongqing, Guangzhou, Harbin, Shanghai, Wuhan and Xi’an. The towns and rural areas were sampled from the provinces of Guangxi, Guizhou, Hebei, Henan, Jiangxi, Liaoning, Shanxi and Zhejiang.